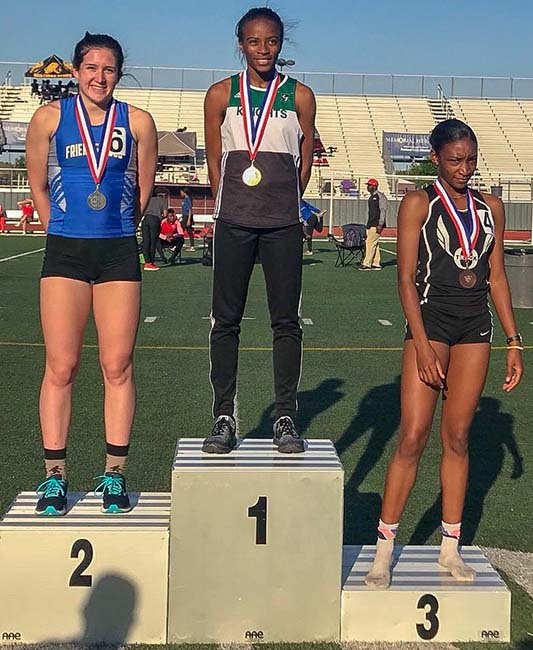 SILVER MEDALIST - Friendswood's Olivia Theall (left) shares the medal stand as the silver medalist for her second place finish in the 800 meters at the Class 6A area track meet held at The Rig in Pearland. Theall finished with a time of 2:20.19 as Kennedy Wade (center) of Clear Falls won with a time of 2:17.00 while Sydney Devereaux (right) took the bronze medal in 2:20.22. PEARLAND — The 6A Region III area track meet was held at The Rig in Pearland and the girls from District 23-6A and District 24-6A competed for a spot in the 6A regional track meet that will determine who will qualify for the 6A state track meet to be held on May 11-12 at the Michael A. Myers Stadium on the University of Texas campus. The girls who finish in the top four at the area meet advance to regionals. Dickinson won the area meet with 98 points while Dawson finished fifth with 56 points, Pearland finished in sixth place with 48 points, and Friendswood finished 12th with 16 points out of a total of 15 schools. Dawson's Chrystal Herpin was the only double-gold winner as she easily won the shot put (41-9) and the discus (139-7). Victoria Herpin placed second in the discus (127-1). Pearland's Alex Kubicek won the pole vault with a height of 12-6. Dawson's Darby Gauntt won a gold medal in the 3200 meters with a time of 11:25.44. Pearland's Kara Decker finished first in the 1600 meter run in 5:14.27. Friendswood's Olivia Theall placed second in the 800 meters with a time of 2:20.19. Pearland's Jackie Arrington placed second in the 100 meter hurdles (14.48) while Dawson's Amari Ferguson placed fourth (14.72). Arrington also qualified for regionals in the 300 meter hurdles with a third place finish in 46.36. Friendswood's Catherine Sims placed third in the 1600 meters with a time of 5:17.95. Dawson's Kalynn Broadnax placed fourth in the shot put (38-7).